In a Nutshell: In today’s connected world, where smart speakers are ubiquitous, and we don’t think twice about asking Siri or Alexa to help us find the nearest Italian restaurant, the popularity of artificial intelligence is immediately evident. Industries in virtually every sector are harnessing AI’s power, with the financial industry being an especially willing participant. Though still in its relative infancy, AI is quickly transforming the abilities of present-day financial advisors, lenders, and rank-and-file bank employees. This movement has prompted significant research into the subject, and Juniper Research recently published findings that suggest the fintech industry will soon see a significant increase in the use of chatbots in financial advising. Gone are the days when artificial intelligence (AI) was just fodder for science-fiction films. Though AI technologies have been present in some form for decades, they have recently begun to take an increasingly prominent role in our lives. And there’s no sign of a slowdown anytime soon, especially in the business world. In fact, researchers predict that, by as early as 2020, customers will manage 85% of their relationships with companies without interacting with a single human being. 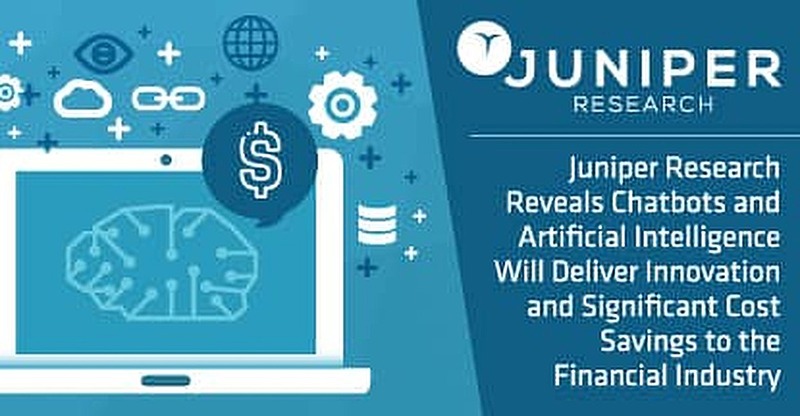 With its latest research efforts, Juniper sought to learn more about the role of AI in the fintech world of investment and banking sectors. Steffen Sorrell, Principal Analyst and Author of the AI in Fintech report, recently sat down with us to offer his insights into how the technology could affect the way consumers bank in the future. Sorrell’s study looked at the role AI presently plays in consumer and commercial lending, insurance, and regulation technology, and offered recommendations for not only the incumbent financial institutions but emerging fintech companies as well. Many of those companies are adding to the chatbot innovations that Juniper predicts could help a range of industries reap an overall cost savings of more than $8 billion by 2022, up from $20 million in 2017. The chances are very good that the last time you contacted your bank, credit card company, or mortgage lender, you first interacted with a chatbot. The pleasant, perfectly enunciated voice asking the reason for your call helps the company better assist you and saves time and resources. What’s more, chatbots help get calls routed correctly, so you can get on with your life. Keeping customers happy is a big deal in the financial services industry, and AI is playing a lead role in that effort. 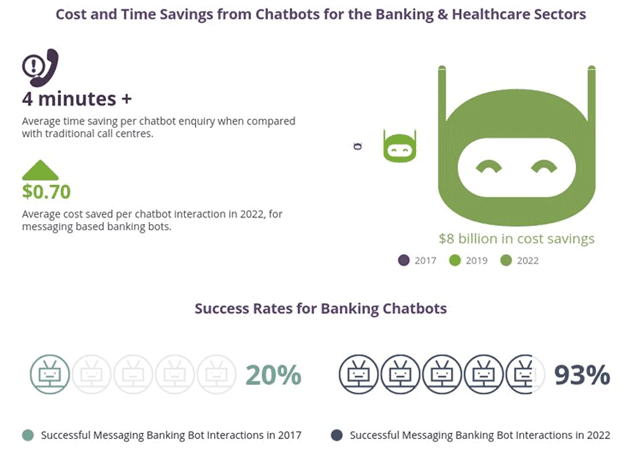 Juniper’s research found that banking and investment are most suited to immediate applications of chatbots compared to other industries. And because customer loyalty is an increasing concern among banks, providing more hassle-free services via chatbots is one way to increase customer satisfaction and retention. Another way to increase retention is to improve returns and reduce costs. To achieve both goals, the AI used in chatbots is getting drastically transformed in the form of roboadvisors. These programs don’t just answer calls, they perform wealth management tasks like investment portfolio maintenance with little or no human intervention at all. Through roboadvisors, the financial advisory market is no longer limited by the number of qualified workers who can provide clients with sound advice. As software continues to progress, roboadvisors are widely thought to be the singular most disruptive force in AI-influenced fintech services. Regardless of results, many consumers may be reticent about trusting an algorithm with making critical decisions regarding their financial investments. This is one substantial hurdle AI faces within the industry. 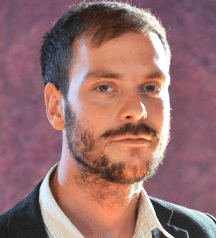 Steffen Sorrell, Principal Analyst for Juniper Research and Author of the AI in Fintech report. “One of the somewhat surprising methods that we’ve seen in allaying concerns related to trust is to actually increase the level of automation,” Sorrell said. “For example, a company like Scalable Capital here in Europe is operating a fully automated roboadvisor with great success, especially among millennials. Sorrell raises a key point here. Currently, roboadvisors operate with some level of background human presence. Given the emotional nature of personal finances, roboadvisors working in tandem with humans will serve to carry the technology forward into a wider arena of consumer acceptance. Though roboadvisors and the AI technology that powers them are still evolving, US financial industries are already lining up to adopt them. Myriad factors are contributing to American investment in AI technology. Principally, many US companies are simply trying to keep pace with the demands of an always-connected consumer base. From e-commerce to banking, customers expect immediate service and a veritable galaxy of choices. As previously mentioned, AI has become a critical tool in meeting these demands. According to a study conducted earlier this year, there has been a 6X increase in annual investment in US-based AI startups by venture capitalists since 2000. This is proof positive that the American AI market is taken very seriously, with substantial funds in place to support its advancement into virtually every industry. In the meantime, the technology behind today’s roboadvisors is still evolving and lacks the ability to completely understand the many nuances of human speech. As with any technology (think smartphones and smart speakers), the advancement in AI abilities and its growing interactions with consumers will make it progressively influential in day-to-day life. And because the financial industry is inherently a data-based enterprise, AI-powered roboadvisors stand to play an increasingly prominent role. Financial advisement is not the only sector being enhanced by AI technology. Since the financial crisis of 2008, lending has seen an increase in AI solutions. This is due, in large part, to the growing demand for credit. Even as credit restrictions have been tightened, demand remains strong, and many service providers have emerged who employ AI to help assess potential lending risk. What the future holds for AI and the many industries it affects remains uncertain. But one thing is abundantly clear — the future is now, and for the financial industry’s AI capabilities, the future is bright. Thomson Reuters Eikon™ Earns "Top Professional Market Data Software"